FlightSafety has one of my favorite quotes, “The best safety device in any aircraft is a well-trained crew.” I believe this perfectly states a fact, that no matter how automated or high-tech your aircraft is, nothing beats good training and proficiency. At Silverhawk, safety is without a doubt a top priority for all of our pilots. On top of check rides every six or twelve months, we also have a list of other items we have to review every year. This October, we were due for our emergency procedures training. What all did we accomplish you might ask? 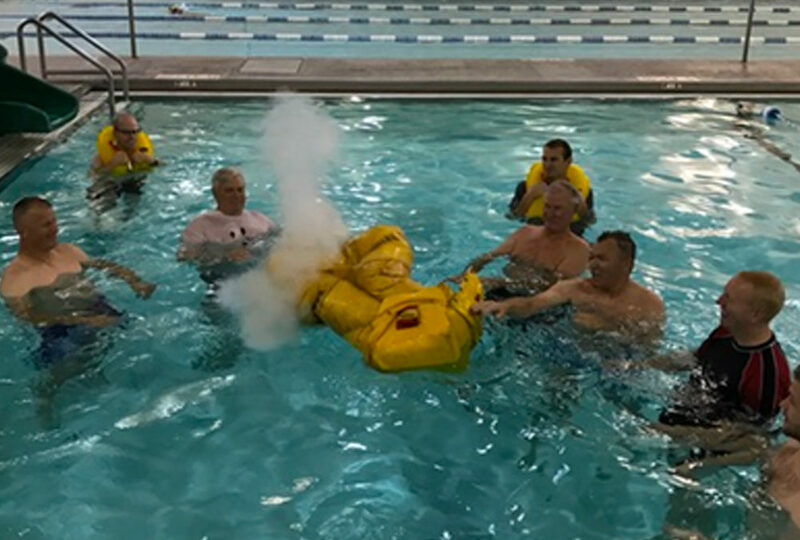 A brief overview includes how to ditch in the event of a water landing, fire extinguisher operation, use of emergency exits, life vests and life raft operation, and how we as crew members should work together during any of these rare circumstances. Since the chances of any of these events are so rare, it’s a good opportunity for everyone to review and discuss what we would do on a very bad day. One of my favorite aspects of annual training isn’t jumping in a pool or putting out fires, but just getting all of our pilots together at once to talk about different scenarios and personal experiences. We do actually get to “play” with fire and get uncomfortably close to one another in a five person life raft, but, at the end of the day, it’s all serious business. When we are able to get all of our minds together, the conversations, ideas, and “what-ifs” make for some very productive discussions. The end result – in the extremely rare event we ever have to put a fire out in an airplane and then land on the water, we are definitely prepared!